data_y (array) – input data required to perform cross-PSD only. detrend (str) – detrend method ([None,’mean’]) to apply on the input data before computing the PSD. See detrend. The input parameters are available as attributes. Additional attributes such as N (the data length), df (the frequency step are set (see constructor documentation for a complete list). if the input data is complex, the PSD is assumed to be two-sided (even length). When psd is set, sides is reset to its default value, NFFT and df are updated. the modification of some attributes (e.g., NFFT), makes the PSD obsolete. In such cases, the PSD must be re-computed before using plot() again. psd: used to store the PSD data array, which size depends on sides i.e., one-sided for real data and two-sided for the complex data. sides: if set, changed the psd. Getter to the original data size. N is automatically updated when changing the data only. Getter/Setter to the NFFT attribute. a user choice for setting NFFT. if None, the NFFT is set to N, the data length. if ‘nextpow2’, computes the next power of 2 greater than or equal to the data length. If NFFT is changed, sides is reset and df as well. Getter/Setter for the input data. If input is a list, it is cast into a numpy.array. N, df and datatype are updated. Getter to the datatype (‘real’ or ‘complex’). datatype is automatically updated when changing the data. None: do not perform any detrend. ‘mean’: remove the mean value of each segment from each segment of the data. ‘long-mean’: remove the mean value from the data before splitting it into segments. ‘linear’: remove linear trend from each segment. this function does not change the object, in particular, it does not change the psd attribute. If you want to change the psd on the fly, change the attribute sides. 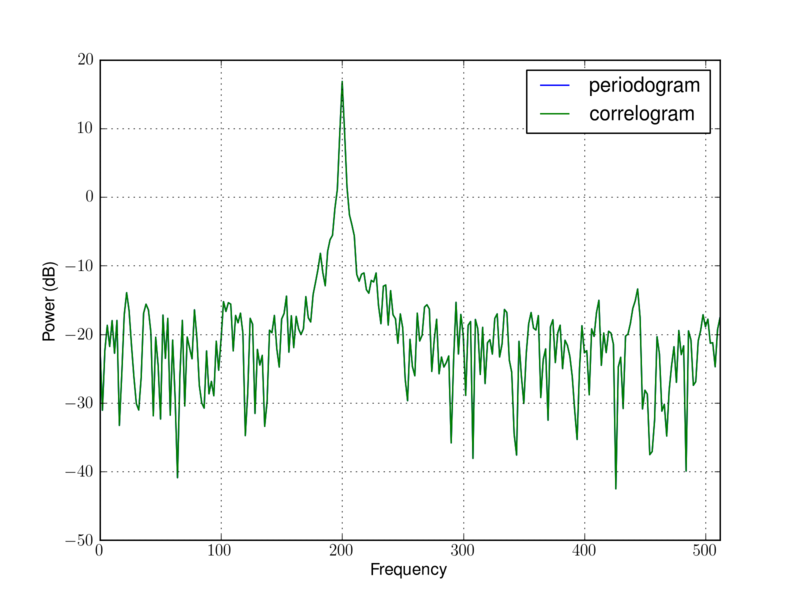 a simple plotting routine to plot the PSD versus frequency. norm – False by default. If True, the PSD is normalised. ylim – readjust the y range . sides – if not provided, sides is used. See sides for details. kargs – any optional argument accepted by pylab.plot(). psd (array) – the array must be in agreement with the onesided/twosided convention: if the data in real, the psd must be onesided. If the data is complex, the psd must be twosided. sides is set to onesided if datatype is real and twosided if datatype is complex. NFFT is set to len(psd) if sides=onesided and (len(psd)-1)*2 if sides=twosided. range.N is set to NFFT, which update df. Read only attribute to a Range object. Getter/Setter to sampling frequency Updates the df automatically. Getter/Setter to the sides attributes. It can be ‘onesided’, ‘twosided’, ‘centerdc’. This setter changes psd to reflect the user argument choice. If the datatype is complex, sides cannot be one-sided. 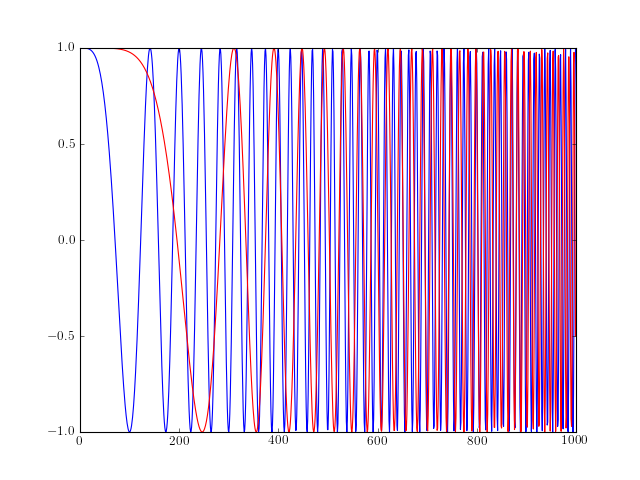 Spectrum based on Fourier transform. This class inherits attributes and methods from Spectrum. It is used by children class Periodogram, pcorrelogram and Welch PSD estimates. data_y – input data required to perform cross-PSD only. window (str) – a tapering window. See Window. lag (int) – to be used by the pcorrelogram methods only. This class has dedicated PSDs methods such as speriodogram(), which are equivalent to children class such as Periodogram. See the class documentation for the parameters. Getter/Setter used by the correlogram when autocorrelation estimates are required. The parameters are extracted from the attributes. Relevant attributes ares window, attr: sampling , attr: NFFT , attr: scale_by_freq , detrend. This class inherits attributes and methods from Spectrum. It is used by children class Periodogram, pcorrelogram and Welch PSD estimates. The parameters are those used by Spectrum. This class has dedicated PSDs methods such as periodogram(), which are equivalent to children class such as Periodogram. Provides two correlation functions. CORRELATION() is slower than xcorr(). 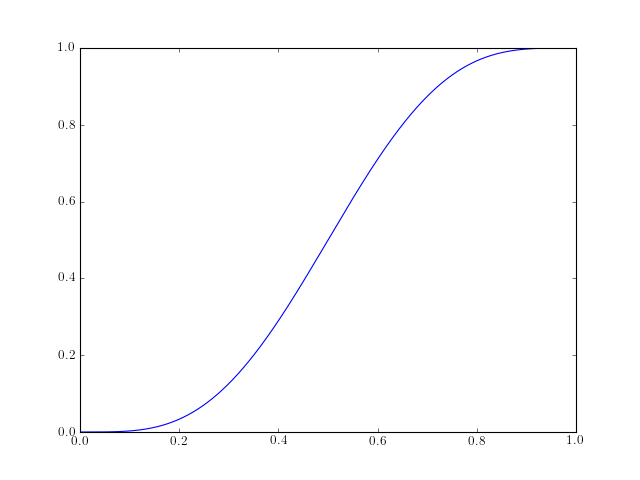 However, the output is as expected by some other functions. Ultimately, it should be replaced by xcorr(). For real data, the behaviour of the 2 functions is identical. However, for complex data, xcorr returns a 2-sides correlation. This function should give the same results as xcorr() but it returns the positive lags only. Moreover the algorithm does not use FFT as compared to other algorithms. y (array) – second data array of length N. If not specified, computes the autocorrelation. maxlags (int) – compute cross correlation between [0:maxlags] when maxlags is not specified, the range of lags is [0:maxlags]. this function should be replaced by xcorr(). Estimates the cross-correlation (and autocorrelation) sequence of a random process of length N. By default, there is no normalisation and the output sequence of the cross-correlation has a length 2*N+1. maxlags (int) – compute cross correlation between [-maxlags:maxlags] when maxlags is not specified, the range of lags is [-N+1:N-1]. However, in practice, only a finite segment of one realization of the infinite-length random process is available. If x and y are not the same length, the shorter vector is zero-padded to the length of the longer vector. pow2db(x) returns the corresponding decibel (dB) value for a power value x.
returns the smallest power of two that is greater than or equal to the absolute value of x. This function is useful for optimizing FFT operations, which are most efficient when sequence length is an exact power of two. In order to keep the power in the twosided PSD the same as in the onesided version, the twosided values are 2 times lower than the input data (except for the zero-lag and N-lag values). returns the corresponding decibel (dB) value for a power value x. In order to keep the power in the onesided PSD the same as in the twosided version, the onesided values are twice as much as in the input data (except for the zero-lag value). The datasets module provides data sets to test the Spectrum functionalities. data_cosine([N, A, sampling, freq]) Return a noisy cosine at a given frequency. TimeSeries(data[, sampling]) A simple Base Class for various data sets. A simple Base Class for various data sets. Plot the data set, using the sampling information to set the x-axis correctly. 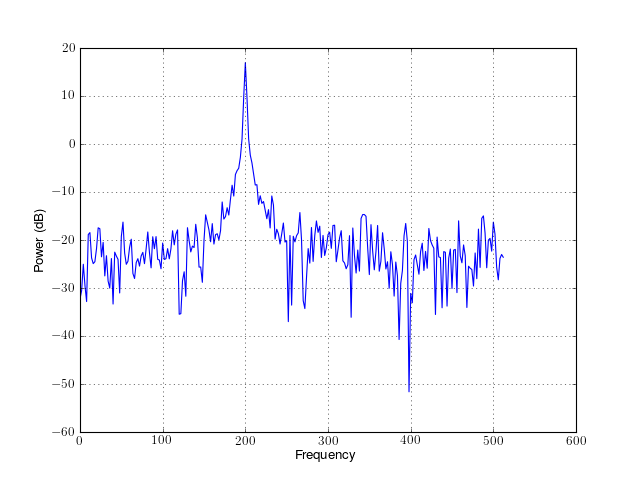 Return a noisy cosine at a given frequency. 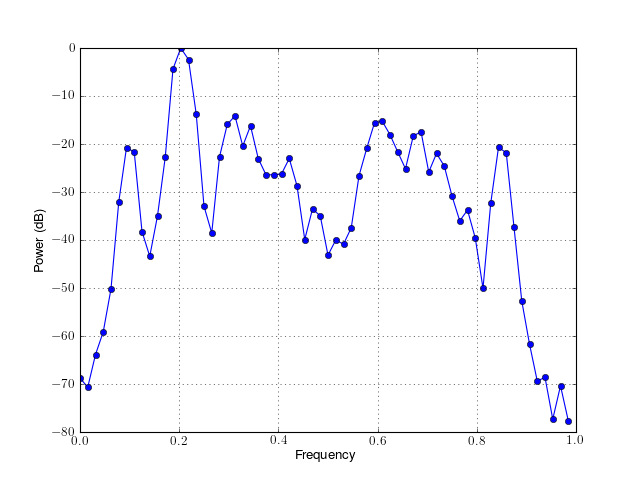 sampling (float) – sampling frequency of the input data. 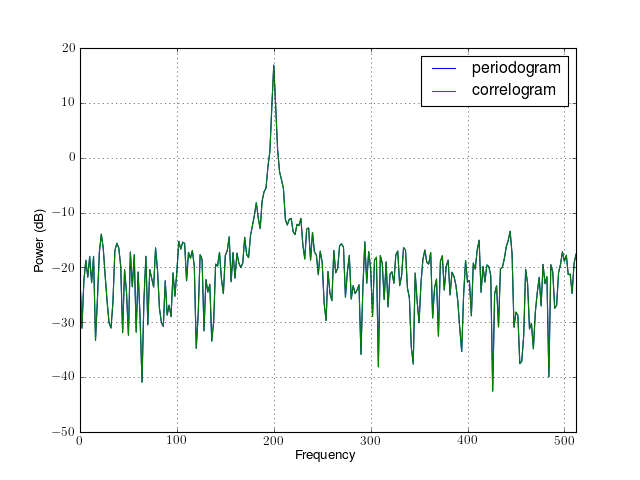 freq (float) – the frequency of the cosine. where w[t] is a white noise of variance 1. CHOLESKY(A, B[, method]) Solve linear system AX=B using CHOLESKY method. Solve linear system AX=B using CHOLESKY method. numpy relies on the numpy.linalg.cholesky for the decomposition and numpy.linalg.solve for the inversion. 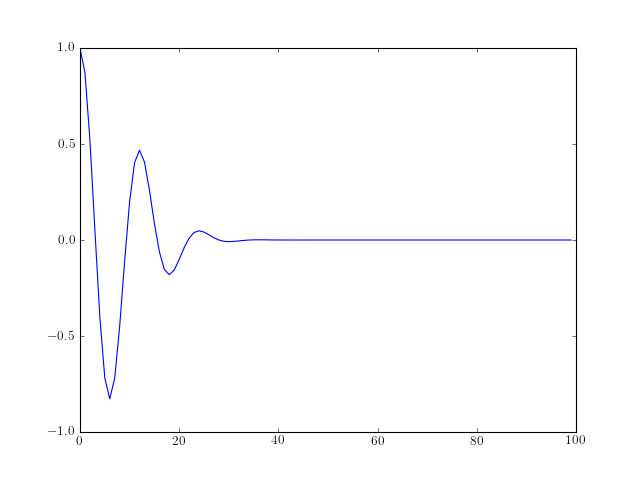 scipy uses scipy.linalg.cholesky for the decomposition and scipy.linalg.cho_solve for the inversion. The classical power method is used together with a fast Toeplitz equation solution routine. The eigenvector is normalized to unit length. TOL – Real scalar tolerance; routine exits when [ EVAL(k) - EVAL(k-1) ]/EVAL(k-1) < TOL , where the index k denotes the iteration number. Internal array E must be dimensioned >= M+1 . LEVINSON(r[, order, allow_singularity]) Levinson-Durbin recursion. order – requested order of the autoregressive coefficients. default is N.
This algorithm solves the set of complex linear simultaneous equations using Levinson algorithm. where is a Hermitian Toeplitz matrix with elements . Solving this equations by Gaussian elimination would require operations whereas the levinson algorithm requires additions and multiplications. where is the input autocorrelation vector, and denotes the complex conjugate of . The input r is typically a vector of autocorrelation coefficients where lag 0 is the first element . 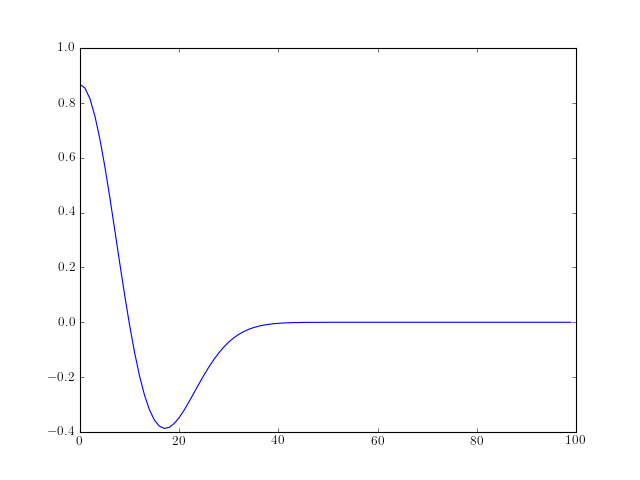 acur the P’th order prediction polynomial based on the P+1’th order prediction polynomial, anxt. ecur the the P’th order prediction error based on the P+1’th order prediction error, enxt. anxt the P+1’th order prediction polynomial based on the P’th order prediction polynomial, acur, and the P+1’th order reflection coefficient, Knxt. enxt the P+1’th order prediction prediction error, based on the P’th order prediction error, ecur. Stoica R. Moses, Introduction to Spectral Analysis Prentice Hall, N.J., 1997, Chapter 3.
computes the autocorrelation coefficients, R based on the prediction polynomial A and the final prediction error Efinal, using the stepdown algorithm. A should be a minimum phase polynomial and A(1) is assumed to be unity. that holds the i’th order prediction polynomials Ai, i=1:P, where P is the order of the input polynomial, A.
from which the i’th order prediction polynomial can be extracted using Ai=U(i+1:-1:1,i+1)’. The first row of U contains the conjugates of the reflection coefficients, and the K’s may be extracted using, K=conj(U(1,2:end)). remove the conjugate when data is real data, clean up the code test and doc. These functions are not yet used by other functions, which explains the lack of documentation, test, examples. Nevertheless, they can be used for production. See numpy.linalg.svd() for a detailed documentation. Should return the same as in [Marple] , CSVD routine. This function is used by PSD estimator functions. It generates the correlation matrix from a correlation data set and a maximum lag. Depending on the choice of the method, the correlation matrix has different sizes, but the number of rows is always m+1. ‘autocorrelation’: (default) X is the (n+m)-by-(m+1) rectangular Toeplitz matrix derived using prewindowed and postwindowed data. ‘prewindowed’: X is the n-by-(m+1) rectangular Toeplitz matrix derived using prewindowed data only. ‘postwindowed’: X is the n-by-(m+1) rectangular Toeplitz matrix that derived using postwindowed data only. ‘covariance’: X is the (n-m)-by-(m+1) rectangular Toeplitz matrix derived using nonwindowed data. ‘modified’: X is the 2(n-m)-by-(m+1) modified rectangular Toeplitz matrix that generates an autocorrelation estimate for the length n data vector x, derived using forward and backward prediction error estimates. R, the (m+1)-by-(m+1) autocorrelation matrix estimate R= X'*X. Evaluate a chirp signal at time t.
A chirp signal is a frequency swept cosine wave.